Poverty is something I think about a lot. My area of Manchester has a pretty high level of child poverty over 30% of children living in poverty. I spend a lot of time visiting hospitals, where many of the patients are living in poverty. Poverty is very real, and food poverty is a big issue. Jamie Oliver, god bless him, once a cute, harmless, young telly chef, is now a self styled guru preaching about food issues. And good on him I suppose. However the rant being reported widely is just sitting very uncomfortably with me. Now, I have been poor and at times still have weeks where the food budget is minimal. I've looked at a tenner left for the week's groceries and thought "oh dear" but I've always managed. I know how to cook. I can buy a veggie box for a tenner and with store cupboard ingredients live quite well on that, and was doing that when Jamie Oliver was still peeling spuds in his father's kitchen. This is one of my points. If you come from a cooking family and learn those skills, you have it made, to a point. Food poverty is something that is often generational. I grew up knowing how to make a barley broth that fills you up, keeps you warm, and last for a few meals. I can make a veggie curry to last a few meals that costs less than £3. Healthy cooking is relatively easy, but that's easy for me, and indeed Mr Oliver to say. The issues aren't as simple as knowing how to cook, or to shop. This may not be a popular opinion but I think that the supermarkets are complicit in deskilling us. When I first moved to the UK I was shocked by the rows of ready meals, these just do not exist in Australia. Ready mashed potatoes in plastic pots? For over £1 when you can buy a sack of potatoes for that on the market? Ready cooked chicken legs? All sorts of things that to produce at home are easy and cheap, but when bought ready made are expensive. Let's face it, if we all were confident in the kitchen supermarkets would take a kicking. It's not as simple as "people don't know how to cook" or indeed how to shop. Food poverty is a complex issue. Often poor communities have poor shops, with little fresh produce. Cheaper to buy a loaf of bread and a packet of fish fingers than get a bus to the nearest bigger centre. Cooking from scratch, if its new to you, is scary. And you don't want to waste what little you have on something you may not be able to cook or indeed eat. People are living on such a tight budget they are choosing between whether to put £20 on their electricity metre or go to the supermarket. Public transport is so expensive that a quarter of the £20 will be used just to get there in a lot of cases. Food is often last on the agenda, even though its so important. People don't necessarily have store cupboards full of staples like rice, pasta and pulses, and even if they did may not know how to use them. Combatting food poverty and helping families live and eat well requires empathy, compassion and real solutions. Sending them to Sicily to see how to make Spaghetti Vongole, whilst delicious and one of my favourites, isn't the answer. When I was at university I spent may hours teaching people how to cook. I used to collect apples and blackberries from the university orchard, which had all but been abandoned and bake pies or crumbles. 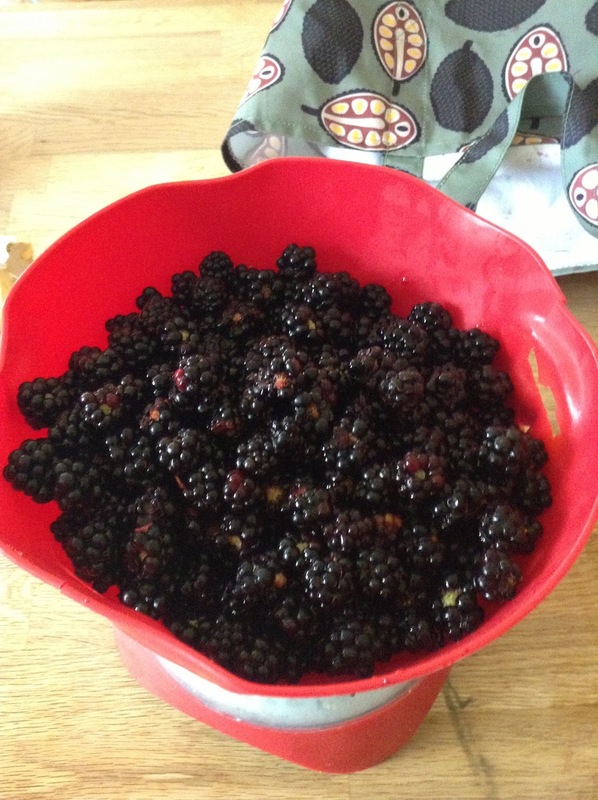 Even last week I picked half a kilo of blackberries. I got stopped by numerous folk saying how nobody does that anymore, and I find that very sad. Food should be a source of fuel, nutrition and fun. It shouldn't be stressful. Food poverty in the UK in the 21st century makes me sad. And I want it to end. But I don't think Jamie is the man to make it happen. Good post. I agree. What annoyed me about Jamie's ''rant'' was the conflation of poverty with things like 'wide screen tellys'' i.e. poor people are feckless selfish gits who'd rather spend on material goods than feed themselves. Not sure anybody would prefer a TV to food....and it's such a generalization anyway. Maybe having a TV means you can entertain hungry kids......who knows? Your point about expensive small shops is totally valid. I live next to a council estate. There is one small expensive corner shop. The nearest Aldi (great for cheap food) is in Luton, a bus ride away. We have to stop BLAMING and NAMING poor people and try to HELP!! It is sadly a sign of the times that there are now 3 food banks in ''affluent'' St Albans. My church supports one of them. OOer..ranted!! Sorry. Great rant thank you. I didn't know where to start with the telly issue. People who are living in poverty don't have much access to entertainment and telly makes sense. Often on higher purchase but that's another issue. There are solutions to food poverty but victim blaming isn't one of them. I have to watch where my money goes, and I enjoy cooking food that lasts for a few meals and working out how much each bowl of that soup cost, or how many meals that one chicken made; and I think I agree with you that Jamie isn't the man to educate people. But conversely, I think it's a good thing he's doing it: he's high profile, lots of people watch his shows - so the more we talk about about food poverty and cooking cheap, delicious food at home, the better. I remember cooking really nice food in home economics in school many years ago. Maybe that's where we should start? Perhaps he isn't the man to make it end but he shook uo and people thinking about it. It is so true people don't jnow gow to cook from scratch without usibg ready made meals or stuff to add. Those products are so much more exoensive tuen making it yourself. Lots of people living in poverty don't eat that healthy either. If they would cut the crap food they woyld be healthier and spend less money on good foods. Bring back home economics would be first on my policies if I was to run for parliament and I do think its great he's talking about it. Someone had to start the conversation and its great the media are picking up on it. I find food budgetting fun, and as you say, the number of things you can do with a whole chicken, or a big piece of gammon. There are ways to feed a family that are inexpensive and just require a bit of creativity and confidence, and I do think confidence is the heart of it, which home economics would help. Yes I agree, its great he's put it out there, and we can talk about it. As I said to Andy I think at the heart a lot of it is confidence. People get into food ruts and prepare what is cheap to them, easy and they know will be eaten. And if that's cheesy chips or fish finger butties then that's what they'll eat. I so agree. This is uncomfortable - on so many levels. People being blamed for living in poverty, for the choices they make about how they spend limited money (from someone who have never thought, 'sod it, I'm fed up with watching every penny, just this once I'll work out how to pay for that tomorrow.') People being blamed for not knowing how to cook (all those TV programmes, he'll say - but no one to teach you how you chop and wash a cabbage). And you're right about supermarkets - they'd have to rethink everything if we all cooked from scratch. And isn't it wrong that, in a country as affluent as ours, that we need food banks - that families, many of them in work, don't bring in enough money to feed themselves. Jamie Oliver's tantrum doesn't address that. It's so complex, I did a lot of research on food poverty using the Greater Manchester Poverty Commission report as my starting point. Metred gas and electric is dearer than direct debit and that's what many council houses have. Public transport is cripplingly dear if your on benefits or minimum wage. I've been a minimum wage earner on a zero hours contract so i have been there, I am grateful for the skills I have, and of course to live walking distance from Bury market! This is a great post, I didn't see the show but I can imagine as I already have an objection to Jamie Oliver's attitudes on how easy it is for every one to cook. His 15 / 30 minute meals may have taken that long to actually cook but the bomb site he created each time must have taken forever (for someone else) to clean up. I cook a lot and can do it on a budget if I have to but I'm sure it's more complicated than just showing someone what to do. What about all the pans / knives / dishes that you will already have if you cook regularly but that non-cooks probably don't have? He started a conversation about it which has opened up the floor to debate and more importantly, has inspired blogs like this, articles, programmes, news stories, arguments and Twitter wars. He should be commended for bringing food poverty into mainstream media. Yes totally agree that its a good thing he has brought into mainstream media, but I disagree with the victim blaming and the fact that he didn't look at some of the real issues behind food poverty. But that's not what makes good telly. My favourite "low budget" recipe book is Tamasin Day Lewis' Kitchen Bible. Her recipes are so sensible and she recommends easy kit to own. As well as food banks wouldn't it be great to have starter kits passed to families with a decent frying pan, saucepan, cook's knife and paring knife, etc. The thing that strikes me about this is that there's a generational aspect to it. Not simply that Home Economics appears to no long exist in schools, but that parents have grown up having ready meals because their parents didn't know how to cook from scratch either, and it's easier to shove something ready-made in the microwave. I'm now in my (cough...can't be possible) in my mid-50's. I never "learned to cook". My mother was a brilliant cook, an instinctive cook - she never had any tuition. My grandmother was the same. I watched them both and, by a process of osmosis, absorbed the basics on which you build and also creating something out of nothing. I know how to cook rather grand things. I also, much more importantly as there's now a precarious budget, know how to improvise. The idea of cooking from scratch must be daunting, if you've never done it before. And, of course, there are difficulties if you live somewhere without a market (and I don't mean expensive organic farmers' markets!) close by. But it is possible to create nutritious meals from very little expenditure. Just takes a bit of thought. And, I suppose, bravery. I can where Jaimie is coming from. All too often you see news reports of people complaining about being poor and more often than not they are in the pub or interviewed at their lovely homes that seem to have everything new. I've known what it's like to be poor too. I grew up with 3 siblings and mum going to work as father had b***ered off! We all grew up knowing how to cook from scratch and I pride myself in being able to 'throw' together ingredients to make a good meal. I fully agree that supermarkets are complicit in the deskilling of folks nowadays. Who the hell would buy ready mashed potato?? I make my own 'ready meals' slow cooked casseroles, curries etc easy peasy..
She's also written about the Jamie Oliver interview today. But what are the real issues behind food poverty? You can look at the monopoly big supermarkets hold over the farming industry for sure, but how much Jamie has to say on that I don't know. Can he really talk about supermarkets de-skilling us when he is linked to a big chain (who have a budget range and offer free recipe cards for cheap family meals)? What he can talk about is what happens in our homes because he sees it just as we do. I think its a bitter pill to swallow but we have to take our portion of blame. We got lazy. The real food poverty is the lack of education about food and cooking. I know plenty of intelligent well educated people who just don't know about food science. It should be taught in schools. I'm not asking Jamie to solve anything, I dont think its up to him. If you are really interested in food poverty the section in the Greater Manchester Poverty Commission report makes interesting reading, and has some real solutions. I don't think its just laziness, its more complex than that. And that's what I take objection to in his comments. Excellent post. It's so sad that people have forgotten how to cook. They say there are some children who cannot name basic raw vegetables as they've never seen them unprocessd. Really interesting post. As someone to whom cooking seems a natural process I do sometimes wonder how and why people struggle with it. I agree that it is a generational and a cultural issue. I think the answer lies in educating children and equipping them with the skills. Young mothers are another group that need to understand food and how it works. It needs to be made accessible and fun. Great post I don't think Jamie Oliver, he should stick to one project at a time. Good post. I was nrought up on stews and soups and suet puddings, all my grans wartime ration meals cooked on a shoestring. But yes, I think Jamie is not the person for this particular march.